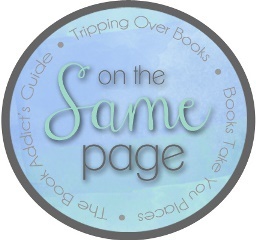 THE WRATH AND THE DAWN was our selection for April to read together for our On the Same Page monthly read along. I have to admit… I was a bit intimidated by this book before I even began. I heard SO many amazing reviews and reactions for this book that I was already afraid the hype would get to me before I even started. And then I started the book. I’m not going to lie to you guys — the beginning was rough for me. As in, I probably would have DNFed it if I wasn’t reading with my best friends. Thankfully the great thing about being a part of this book blogging and reading community is that along with my BFFs, I had great support to encourage me to keep reading. See, when I had heard all of this hype, I hadn’t heard anyone who had struggled with the beginning so I was wondering if it was just me. Thankfully, we all read on and with reassurances from Alyssa and Amy (who were ahead of me) and pretty much everyone who saw my reading updates on Goodreads, I continued reading and they were all right. It got MUCH better. I kind of had a hard time shaking off that rough start. I felt a bit dropped in the middle of an unfamiliar setting with a head-strong female lead. Head-strong and willful isn’t a bad thing but characters like Shazi do take some time for me to get to know sometimes. Once I know them, I’m usually all about the determination and ferocity, but I usually need to explore the setting and the plot (you know, make sure I should be on board with their cause) before I start to love them so that was something that took me a while to appreciate. Once I did get to know Shazi though (make that all of the characters), I really did love them and I’m so glad I got to know their stories. I had a lot of fun once I really started to get into the thick of things. The world-building was quite fascinating, full of rich descriptions, interesting magical elements, and just had a great overall feel. All of the characters really started to shine and I really loved every single one of them — well aside from the baddies, of course — but even the antagonists were incredibly interesting. It took a little time for things to develop but I like how natural it felt to let these things unfold, especially in the case of the romantic elements. Renee Ahdieh’s writing was quite beautiful and it was just lovely to let myself really feel out this world and sort of develop around me. THE WRATH AND THE DAWN concludes with punch after punch and it turned out to be just as thrilling as everyone had promised! Lives on the line, relationships in jeopardy, kingdoms at stake, and really everything reaching its pinnacle all at the right moments. It definitely had me wanting more which is both good and bad since I really enjoyed the conclusion but now I have to wait for book two (which is a ways out considering I read this book even before its publication date). All-in-all, I really enjoyed THE WRATH AND THE DAWN and how Renee Ahdieh adapted 1001 Nights into the storyline. It was a great original story with a hint of that something familiar (even reminded me of Aladdin in a specific marketplace scene!) and although I had a bit of a tough time in the beginning, I do think it’s quite worth the read and recommendation! Shazi // Character Obsessions: Revenge, freedom, love, justice. I had a bit of a hard time with Shazi at first. Not because I disliked her but sometimes it’s hard for me to jump right in with characters and she happened to be one of them. Since she’s our main character, I figured her reasons and actions were justified but it took a while for me to warm up to her before I really started appreciating her. I think it’s hard for me to meet a character at a point in their life where they’re just angry, even if their reasons are justified so yes, I did end up loving Shazi but it took me just a little bit! Khalid // Character Obsessions: Honor, ruling, protection, survival. Khalid is my favorite character of this book… and it so did not start that way. I really ended up loving his character, appreciating his conflicts and struggles, and really sympathizing with him. I just loved getting to know him and finally understanding all of his interactions with Shazi. I can’t wait to read more about him!! Kept Me Hooked On: Middle Eastern influences. I actually don’t think I’ve ever read anything taking place in this region/with these influences! (Have I? Nothing comes to mind right away.) I really enjoyed it! I hadn’t written it off or anything but the region and culture are just so unfamiliar to me that it’s not something I normally gravitate towards. I’m really glad that I enjoyed it so much and Renee Ahdieh really did a fantastic job with all of the world building and lush descriptions of scenery, food, characters — everything. I was totally entranced. Left Me Wanting More: Interest in the beginning. It wasn’t just that it was a slow start for me. There was something that was actively turning me off when I started the book. I mean, I’m definitely glad that I kept reading and once I understood the plot and why the book started where it did, I was totally okay with it but for some reason it was really hard for me to read with the book starting at that point in the characters’ stories. This book was really good! I’m definitely anxious for book two. If you struggle with the beginning, I really hope you have a situation like I did where it really picks up shortly after that. I ended up really liking the book a lot! I read THE WRATH AND THE DAWN for the On the Same Page monthly read along with my two friends Alyssa & Amy! They have great posts ready for you today to so be sure to check out both of these, especially if you’re excited for the book! This entry was posted in Books, Fantasy, Retelling, Review, YA and tagged 1001 Nights, Books, Fantasy, Renee Ahdieh, Retelling, Review, The Wrath and the Dawn, YA, Young Adult on April 29, 2015 by Brittany. Great review! I am glad you enjoyed this one. I have been torn, but it sounds like a great read. OOoh nice review!! I was curious about this one before but now I am pretty much sold on it! It sounds awesome! Great review! Thank you! I hope you enjoy it when you get to it!! I’m totally with you – the beginning felt a little mehhhh but then things HAPPEN and you’re like YES and you don’t want to stop reading like EVER. I’m seriously SO excited to read The Wrath and the Dawn, but I’m glad to have a bit of warning about the start being a bit slow for you. It does speak to the book’s excellence that it eventually won you over though. Glad you wound up liking this one, even with a shaky start! I noticed this one the other day and wondered about it. There was both something that grabbed me about it and something that put me off. I can’t put my finger on just what it was, though. Maybe I should give it a shot…sometime this year. SO many books seem to start off super slow and finally kick into high gear later. I feel like I’ve been saying this a lot lately, but it’s just the truth! I really want to know what’s going on; I don’t think it was always this way, at least not for me. Regardless, I’m definitely excited for this! It sounds so cool, and definitely unfamiliar for me as well. And I can’t wait to see what made you love Khalid so much! I am SO glad you were reading it with friends and stuck with it! I really loved this book and felt it was such a strong debut and I HAVE to read the next one as soon as humanly possible. I neeeeed it. I’m so happy you ended up loving it too. Yay! I am really looking forward to picking this one up, I do have a tendency to get worried about hype and I push books down my list . I will keep in mind to push through if I struggle with the beginning!